Tackling a heavy agenda on Thursday night, West Hollywood’s Planning Commission approved a condominium project on Spaulding Avenue, gave its blessing to the Sunset Spectacular digital billboard project and weighed in on a proposal to reduce the amount of parking spaces commercial properties must provide. However, the Commission postponed providing feedback about the draft Environmental Impact Report for the new French Market project when the meeting was running extra long. With a unanimous vote, the Commission approved a four-story, 22-unit condominium complex on the southwest corner of Spaulding Avenue and Romaine Street. 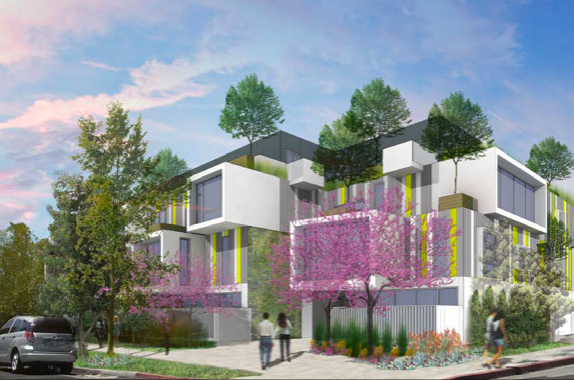 With four units set aside for low-income residents, the project will cover four adjacent lots at 939-949 Spaulding Ave. and 7732 Romaine St. Those lots currently have single-family homes and accessory building for a total of eight existing rent-controlled, residential units. The Commission previously considered this project at its Aug. 2 meeting, but deadlocked over whether to grant a variance regarding the front setback (distance from the sidewalk to the start of the building). The city’s zoning code states a front setback should be the average of the setbacks of the adjacent properties, which in this case would be 26 feet. However, the developer, AA CA Property Portfolio 2 LLC, was asking for a variance to have a 15-foot setback, and three of the commissioners were uncomfortable approving that variance (one commissioner was absent). In the two months since that meeting, the architect, John Friedman of the Los Angeles-based JFAK Architects, reconfigured the building slightly and the developer agreed to change two of the four low-income units to very low income units. That change to very low income units made the project eligible for another building concession from the city. The developer asked for the 15-foot front setback as that extra concession, thus eliminating the need for the variance request. While the Commission had no issue approving the front setback as a concession, several residents cried foul, saying they were not notified of this change from a variance request to a concession request. They felt that information should have been including on the mailing sent out regarding this hearing, as well as the signs posted on the property. However, city project planner Laurie Yelton reported mailings and notices typically contain information about demolition requests, building requests, etc., but not variance requests. Of the ten people speaking during public comment, eight opposed it, some calling the building “hideous” or a “monstrosity.” Several others said it was out of scale for the neighborhood and they would lose privacy. Several neighbors also were upset by the loss of a cluster of redwood trees, which were planted about 100 years ago on one of the lots. However, an arborist hired by the developer explained that those redwoods, which are not native to Southern California, were unhealthy and dying, thanks primarily to receiving reduced water in recent years due to the area’s ongoing drought. With a unanimous vote, the Commission also gave thumbs up to the slightly revised “Sunset Spectacular” digital billboard project and accompanying plaza planned for Sunset Boulevard, agreeing that erecting the billboard tower is consistent with the city’s General Plan, which guides development in the city. Set to go into the city-owned parking lot at 8775 Sunset Blvd. 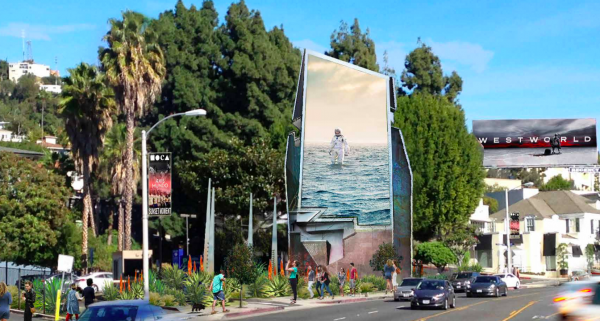 (the old Tower Records overflow parking lot), the 67 foot tall Sunset Spectacular will have three vertical panels, or “petals,” connected via a skeletal frame. The two petals facing Sunset, each 25 wide at the base, will have video screens which display digital advertising 80% of the time and digital public art the other 20%. The north facing petal, just 21 feet wide at the base, will NOT have a video screen. The city is set to receive a minimum of $11 million over ten years, possibly as much as $20 million, via its contract with Orange Barrel Media, which will cover the $9.5 million construction cost and also sell the advertising for the billboard. Architect Tom Wiscombe designed the structure and accompanying plaza area. The commissioners were impressed with the project, Commissioner David Aghaei calling it “innovative signage,” while Commissioner Stacey Jones speculated it will become a destination for tourists and residents alike. Commissioner Rogerio Carvalheiro praised the project and suggested the city convert the parking lot into a park for the neighborhood that has long been demanding more green space. “We’re not supporting the [digital billboard] project completely by keeping the parking in this location,” said Carvalheiro. Commissioner Lynn Hoopingarner echoed his sentiments. With the Commission’s approval, the Sunset Spectacular is scheduled to go to the City Council for final approval in November. Commissioner John Altschul recused himself from the deliberation since he lives within 500 feet of the project, while Commissioner Sue Buckner was absent. With a 4-2 vote, the Commission gave its approval to a tentative plan to update the zoning code regarding the number of parking spaces various commercial businesses are required to have. Arguing that the city’s current parking requirements, set shortly after the formation of the city in 1984, are out of date, city staffers presented a plan which they believe will help bring new business to the city by reducing the onerous number of parking spaces businesses must provide for customers. Under the proposal, parking spaces for general retail businesses would reduce from 3.5 per 1,000 square feet of retail space to 2 per 1,000 square feet. Restaurants would reduce from 9 per 1,000 square feet to 3.5 per 1,000 square feet. Bars and nightclubs would reduce from 15 per 1,000 square feet to 5. Gyms would reduce from 10 per 1,000 square feet to 3. Private gyms and fitness/health centers would reduce from four per 1,000 square feet to two. Hotels would reduce from one space per guest room to one-half space per guest room. If the plan is implemented, existing businesses also would be able to petition the city to reduce their parking requirement as well. Jackie Rocco, the city’s business development manager, and Brant Birkeland, the city’s business development analyst, noted transportation options are changing thanks to ride share operations like Uber and Lyft, thus reducing the need for all the required parking spaces. They also noted fewer people own cars these days and many are working from home. Overall, the Commission favored the idea, Commissioner Rogerio Carvalheiro saying he wholehearted supports the plan. David Aghaei called it a good response to the changing times. Commissioners John Altschul liked the idea, but voted against it, believing it might be too drastic a reduction too quickly. He favored implementing it halfway now and the other half once the subway through West Hollywood is completed, if Metro approves building such a subway. Altschul also feared City Hall would be overwhelmed by businesses coming to get their parking requirements reduced. He also worried such reductions could impact parking in the residential areas, especially if implemented too quickly. Commissioner Lynn Hoopingarner, who also voted against it, shared Altschul’s concern about the parking in the neighborhoods. She also worried that developers might propose a building for a type of businesses with a fewer parking requirements (because it would be cheaper to build with less parking), and after approval switch to a business that had higher parking requirements at the last minute. Commissioner Stacey Jones voted in favor of the project, but feared there might be unforeseen consequences for the residents. Of the eight people speaking during the public comment period, seven supported it. Genevieve Morrill, president of the Chamber of Commerce, said it could be a “game changer” for small businesses wanting to come to the city, noting the parking requirements often make it too expensive to open in West Hollywood. John Adler, who owns parking lots on Robertson Boulevard and La Peer Drive, liked the plan even thought it could affect his business. He reported that DUI lawyers and valet parking operators are dying professions thanks to Uber and Lyft. Rocco and Birkeland also suggested that the number of vacant stores in the city likely would reduce if businesses did not have to contend with providing all the parking currently required. Altschul suggested it is more likely the high rents landlords charge that keeps some businesses away, not the parking requirements. By the time those three hearings were completed, it was almost 11 p.m. and everyone was tired. The Commission opted to postpone discussing the draft Environmental Impact Report for the French Market office-retail complex at 7985 Santa Monica Blvd. at Laurel Avenue. As proposed by developer Jason Illoulian, the existing French Market building will be preserved, while another two-story retail-restaurant building will be erected in the area that was the French Market’s parking lot. At the rear of the lot, a four-story, 60-foot-tall office building will be built. The Commission will provide feedback on the French Market project at its next meeting, scheduled for October 18. REALLY? Is this a prank story. WeHo has had a lack of adequate parking since the day it was incorporated. The City has spent hundreds of Million dollars, yet not created one single new parking spot for residents in the HEAVILY IMPACTED AREAS WHERE THEY LIVE. In fact. at various times the City re-painted specific small portions of curb, making one less parking spot on streets already desperate for parking by people living normal lives, and driving home after work, and sometimes spending an hour or more or having to park so many blocks from their own home, because there is not enough parking for the every day regular hard working people trying to get by. 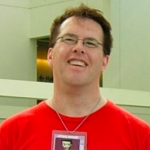 This issue has been brought up many times over the years. Specifically the areas most affected. I’ve read desperate please by people who can’t go home after work because there is not a single spot within a mile of their apartment. Another commenter still sticks with me. A woman, already the victim of one street crime, has to park so far from her home and then has a terrify long run/walk back to her apartment – is sheer terror for not just the ever growing city wide crime, but from her own personal assault walking from her car to her home after a long days work. She had been walking for so manly blocks, was getting physically exhausted (whish she often was when had to park so far from her home, when some man came from behind and assaulted her before taking her keys. She was crying asking why didn’t he just steal my purse. I was exhausted and couldn’t have even tried to fight back – but she was brutally assaulted for no reason. She is a full time low income earner. She can’t move and works hard all day, then spends at least a half an hour finding a space, sometimes much more. THE CITY TARGETED AREAS WITH AN EXISTING PARKING SHORTAGE – CALCULCULAGTED HOW MUCH MORE PARKING TICKET REVENUE THE REMOVAL OF ONE PARKING SPACE BY RED PAINT EXPANSION – IT WAS SHOCKING HOW MUCH THE REMOVAL OF ONE SPOT RIPPLED THROUGH AN EXISTING CRISIS AREA something like a multiple of 25 more tickets a night with the removal of just one existing street spot. This was a reported story time and again, when there was another source of local media reporting (PATCH – KEN’s News page I forget the name). This blog never posts stories that exposes real stories of real people living and working weho and being victimised by the city who has been increasing parket ticket revenu for years with every possible way. THIS IS AN OUTRAGEOUS SUGGESTION OF REDUCING REQUIRED PARKING IN WEHO BELOW THE ZONING MINIMUM. Let’s look out for each other. VOTE OFF ANYONE WHO HAS BEEN A COUNCIL MEMBER WHO HAS BEEN SEATED AND HAS NEVER DONE ONE THING TO HELP THE REAL PEOPLE WORKING HARD FOR LOW WAGES – having to spend so much time to park and get inside and just sit down after such a long days work. I live on Ogden Dr just north of SM Bl. On our block several metered spaces were reduced, making the spaces larger, but less of them. I never understood the logic behind that. I didn’t realize this was happening city wide. Makes me sick when I think of the corruption happening at city hall. I’ve heard stories about these council members for years and more and more the evidence of their corruption is obvious. When will the state step in and clean it up? ?